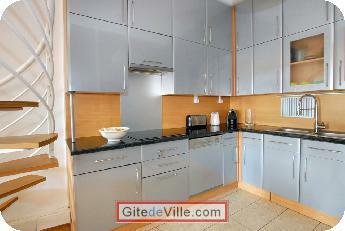 Self Catering Vacation Rental of 115 m² in Lyon for 4 peoples. A 115 sq.m. 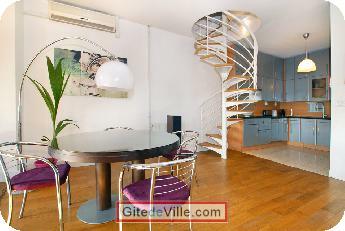 furnished duplex apartment with 2 bedrooms. 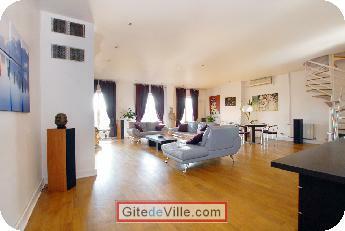 Large living (66 sq.m. ): 3 seat sofa, 2 seat sofa, 1 armchair, table, chairs. Mezzanine bedroom (15 sq.m. ): double bed (160*200), cupboard. Bedroom (9 sq.m. ): 2 single beds (90*200), wall cupboard. Bathroom: bathtub with shower screen, shower, double washbasin. Equipments: dishwasher, washing machine, LCD TV, LED TV (French and foreign channels on IP), Internet connection (DSL and Wi-Fi). On the 5th floor with lift.